Last week, Ashley Oppon from Dreadlock Tarot emailed me. 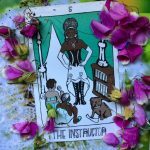 She loves to feature minority voices and unique approaches to tarot on her blog, and would I be interested in an interview about what ‘queering the tarot’ is all about? Right back atcha, Ashley! I am *forever* looking for awesome people of colour to feature on Little Red Tarot and had lots of questions about how her colour and culture influence Ashley’s work. So we hatched a plan to offer you not one but two interviews! 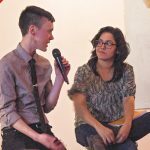 The first, where Ashley interviews me about queerness and tarot, is over on her blog. Check it out! And here’s the other – Ashley answering a few of my questions about the intersections of her race and her tarot. Ashley Oppon is a professional tarot reader from central New Jersey. She’s a first-generation American, with a Ghanaian father and Jamaican mother. When she went professional with her tarot practice, she named her business Dreadlock Tarot, after her own hair, a symbol of her culture…and her favourite singer – Bob Marley! Ashley is also a practicing nurse. What was your first encounter with tarot, and how did that lead to you making it such a big part of your life? So my first encounter with tarot happened because of a break up with my first love. I have always been into “new age” stuff, but never really did much about it except read tons of books on the subject. So when I was 20, I broke up with my boyfriend and because I was 20, it was pretty much the end of world. One day I was in one of the places that makes me happiest, the bookstore, and I ended up in New Age section looking at books about relationships and astrological compatibility I looked down and saw the tarot decks and a pack that said, “Easy Tarot: Learn to read the cards once and for all!” by Josephine Ellershaw. I thought, well this would be interesting, plus maybe I can figure out if my boyfriend and I will get back together. When I opened that book, I read it cover to cover. I slept with the cards under my pillow and charted every piece of symbolism I saw in them. I stopped asking if my ex-boyfriend would come back and started asking questions like, “Why am I so obsessed with him?” and “Is this even something I really want?”. Without even doing it consciously, tarot started healing me. It was nuts. The next couple years I was in and out with tarot, mostly because my readings started to scare me. The stronger my intuition started getting, the more I started to freak out. At one point, I even got rid of all my cards because I just couldn’t handle it. Then about 2 years ago, after being reprimanded by an uber religious family member and giving up tarot for the second time, I began to realize I am who I am and what I was doing was helping people. So why was I scared? The moment I started to embrace it, my life started to change for the better and I haven’t looked back since. When did you decide to do this professionally, and how are you finding that? You’re a really out-and-about kinda reader, and you do lots of events – that must be a lot of fun! I officially started my tarot business last year with the help of the Tarosophy Business Development Program. One of the biggest things I have learned from starting my own business is that it takes a lot more than just being a good tarot reader! It takes a lot of self motivation and a lot of getting out of your own way. You also can’t be upset when you aren’t an overnight success. It takes time and energy to get to where you want to be. I do like to do a lot of festivals and fairs and things like that because I love the energy. I like street fairs in general, so being a vendor at one is super fun for me! It can be hard working things around my nursing job, but I usually find a way! I want to eventually want to do this full time but for now I’m just gonna juggle these two jobs until I make enough money to support myself. How would you describe your approach to tarot, your core beliefs? In addition to reading the cards, I also use my intuition in a tarot session. So on a spiritual level, I look at tarot as a tool to help one connect to the Divine. I, as the tarot reader, really consider myself as the vessel to present my clients with information that they might not be able to see or recognize on their own. On a very real world level, I think that tarot is a trusty adviser who won’t sugarcoat stuff. Either way when I give a reading, I’m letting you know what’s up, but also want you to feel like you have gotten some resolution or at least some clarity. I also think tarot is so awesome because tarot is for everyone. No matter who you are, tarot can relate to and help you in any situation. You named your business after your dreadlocks as they are a representation of your culture and your self. Do you use tarot in culturally-specific ways? I was raised Catholic (not very strictly) but my dad always told me (and still does) really neat stories about spirits he had seen, and “juju” (its a kind of rude term West Africans use to describe the occult) men and woman he has met. I’ve heard all sorts of Jamaican stories about ghosts of slaves setting things on fire and all sorts of crazy things. But it’s pretty funny because I actually don’t really add a lot of things from my culture in my readings and it seems like many people are disappointed. Being a black tarot reader, just like being any type of minority, comes with it’s stereotypes. Sometimes when people find out I’m Ghanaian, they are waiting for me to throw bones or cowrie shells, and when I don’t they are disappointed. When they find out I’m Jamaican, they are waiting for me to be some type of Obeah woman (Jamaican term for people who do any occult stuff) or be Ms. Cleo. Now, while there is nothing wrong with any of that stuff (expect for Ms. Cleo because she was a fraud), it’s not me. I do find that my Black clients feel very much like I can relate to them better because we are the same race. And a lot of my Black clients tell me they have never met a Black tarot reader who didn’t do “work”. You got to understand, in America, a lot of Black people who go to see readers or have any interest magic or alternative spirituality feel this internal shame because of how religious many Black Americans are. I’m not gonna get into the whole issue with Black Americnas and African spirituality because we will be here FOREVER (blog post coming soon), but when they see me for who I am, a regular person like them, it helps them cope with that shame and not feel so bad. And like I said, there wrong with doing work/magick/rootwork/hoodoo or whatever you do, it’s just something I don’t do, and it seems to help people relate to me better. Do you actively seek out decks that represent you? I’m always looking for a deck with black faces that I can relate too. But I haven’t found one yet. I’m in a very weird place culturally. I am a first generation American, so even though I was born and raised in this country, my version of being an “African-American” has been a bit different than many of my peers. There aren’t many decks out there, and I have only seen one African-American deck which I didn’t really relate to at all. The stories and imagery of the African-American folk tales were not the stories I grew up with. Most of the African decks I usually see concentrate on stories of the Orishas, which are really only a Nigerian thing or people for people into the ATR’s and DTR’s (African Tradition Religions or Diaspora Traditional Religions) which I can’t really relate to. In the end though, it has never bothered me too much. It’s funny because I was the kid with only Black barbies, read books about Transatlantic Slave Trade at 5 years old, and have always been very Afrocentric. But when it comes to tarot, I find that it defies race and culture lines, and just is what it is. What’s your best advice for someone who has just picked up their first tarot deck but doesn’t know where to start? Read a lot of different things by a lot of different people. Don’t just read one book and think that is the be all and end all of tarot. Then just do some tarot everyday. Pull a daily card for yourself, pull cards for your friends, pull a card for your favorite singer, it doesn’t even matter what you do, as long as you just keep practicing. That is how you will develop your own style and way of reading. Oh and don’t forget that learning tarot is a life long process. Even the tarot greats will tell you they learn new things every time they pick up their deck. Wanna pull me a card? Question: Should I go away for the winter or hang out in Manchester? So I pulled two cards, one for each option. So for the option of going away for the winter I got the Knight of Swords. This tells me that going away for the winter might be fun, but when you come back you might feel like you wasted your time leaving, and wish that you had just stayed in Manchester. For hanging out in Manchester, I got the Seven of Pentacles. If you stay in Manchester, it seems it might not have as much fun, but you will certainly get a lot of work done and come Spring you will be really satisfied with everything you have accomplished. You can find Ashley at Dreadlock Tarot, and don’t forget to check out her corresponding interview with me right here! I’m a 30-something writer, artist, tarot reader, and perpetual explorer of the space between thought, feeling, and action. I believe that spirituality and ritual are for everybody. I’m about the journey, in all of its messy, non-linear, chaotic iterations. I am excited by anticapitalist business and living with my whole entire self present. I use tarot cards to bring forth hidden truth, and ritual to affirm my commitment, over and over, to my ever-shifting path. Kori is a non-binary trans person, long time activist and community educator. In this interview, they explain how they use tarot in their work as a personal coach. The Facebook event was mysterious—what exactly would “a contemporary queer re-visioning of a beautiful feminist tarot deck from the 80s” be? This is fantastic. I really enjoyed this. As someone who is black, and also of Jamaican parentage, I find the comments here really interesting. Reading in the Jamaican context, I have to clearly define what it is I do as a reader. That can be a challenge because of local perceptions about what the tarot is, and how people perceive Tarot as having some sort of intersection with “Obeah.” It’s more of a challenge to define what you are doing in this sort of context, especially when the culture is not so much geared to people soliciting these services online, where you can spell out exactly what you do, as well as your approach to Tarot. I also agree so much with Ashley’s experience of Tarot as being something that ”defies race and culture lines” – for some reason it’s able to do that. When I work with my deck I’m really connecting to the energy of the archetype, and there’s something really expansive about that process which puts less pressure on me to connect to images in a deck which ostensibly “represent me.” Thanks for sharing! Found this interview via a Google search and loved it. I’m familiar with Ashley, and have read her site, Dreadlock Tarot previously. Learned more about her and it cemented my positive impression of her. 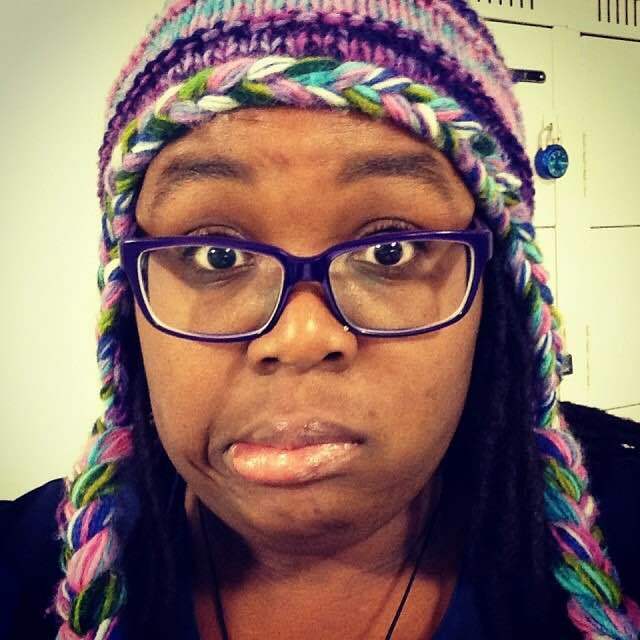 Thank you for this – and Ashley – you’re not the only Black tarot reader who didn’t necessarily relate to the Orisha stories and decks. My favorite decks are those created by Ciro Marchetti – specifically the Gateway to the Divine Tarot, which is my favorite and most often used deck.